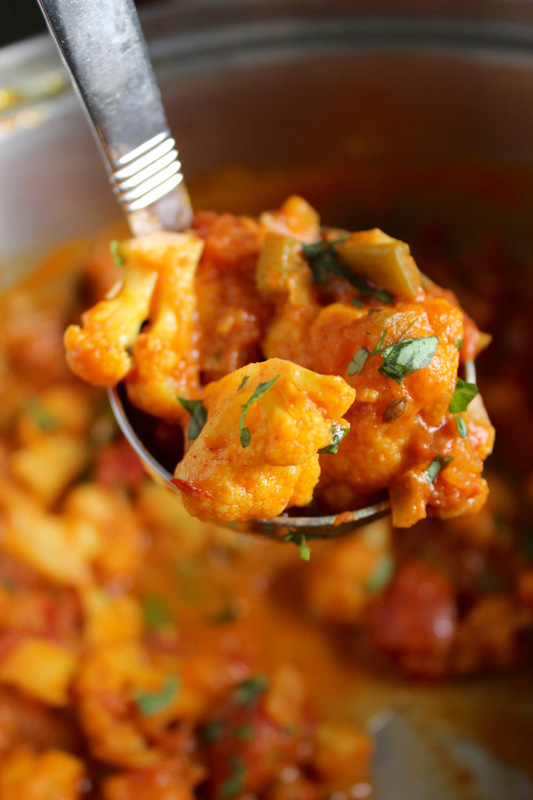 This vegan cauliflower curry recipe is one of my all-time favorite things to make for dinner. It has a delicious tomato and coconut milk base, it’s beyond easy to make, and it comes together in 30 minutes. Clark makes the Indian food around here – it’s his thing in the kitchen. 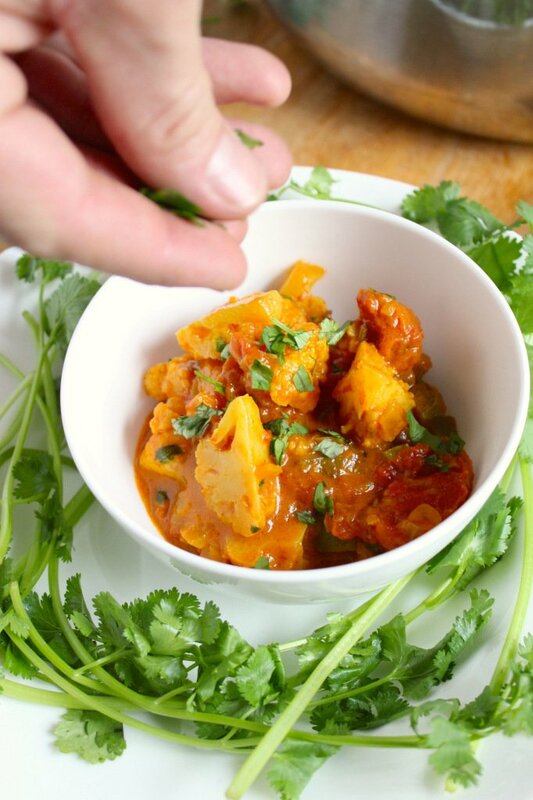 When he’s making a curry or vinadaloo, he disappears into his own world. Armed with a towel over his shoulder and his apron to prevent lethal turmeric stains, he sizzles and spices and stirs for upwards of an hour and a half, tending to the meat, curry, and rice all at once. It’s a flawless routine that I prefer to watch rather than be involved with – unless you count peeling the potatoes. Fennel is an ingredient that we don’t use very often and Clark said he wouldn’t have thought to add it to this dish if the recipe hadn’t suggested it. But it’s a common ingredient in Indian dishes – it’s used to add subtle sweetness and balance to a recipe. And its seeds are often chewed to freshen breath and to aid digestion after a meal. 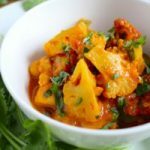 This particular recipe is based on a cauliflower dish that we found in Indian: Shortcuts to Success by Das Sreedharan. Despite the unassuming cover, the book itself is filled with gorgeous photos and – judging by the 3 we’ve tested so far – it includes a ton of incredible, foolproof recipes. It was Sreedharan who suggested the fennel and he didn’t steer us wrong. The rediscovery of our local library a couple of weeks ago is what really led up to this recipe. I spent lots of my youth in that place, mostly downstairs in the YA or special interests section, checking out every horse-related book and movie they had and asking for new arrivals. Nowadays, you can find me in A) the food or B) the gardening section and C) I’m aware how old that makes me sound. But seriously, they have a book for everything! Every kind of ethnic food, every ingredient, every diet – it’s a wonderful black hole of inspiration. Looking at a cookbook is perfect a way to see food through another cook’s eyes. It’s not every day that I’m lucky enough to be exposed to new cultures, but these books feel like a secret passage to other worlds. I love to see what people create using ingredients, like fennel, that they have available in their part of the world. I love reading about techniques and processes and learning why they’re important. And everything that I absorb, I can apply to my own food. It’s like culinary school, but without the tuition and lessons in pastry. If you haven’t been to the library in a while, I highly recommend it. Whether you’re into cooking or architecture or Civil War era fashion, odds are, you’ll leave there inspired. It’s good to be curious! 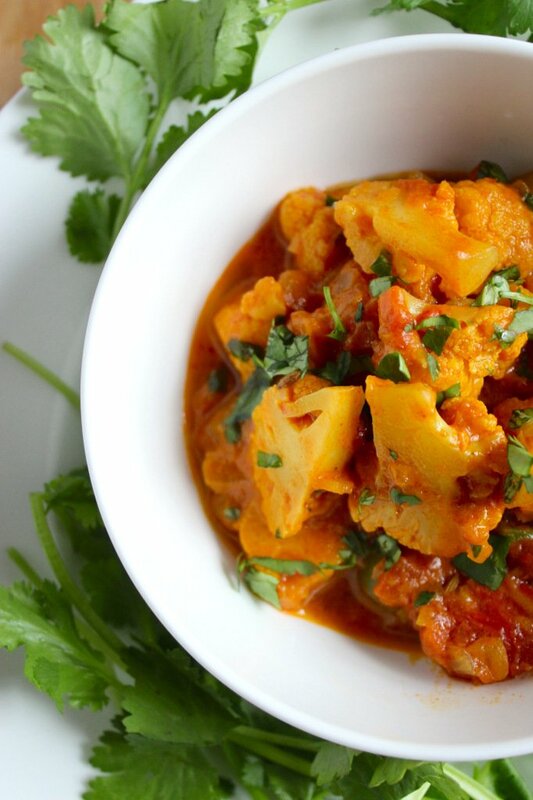 This traditional curry recipe combines cauliflower and aromatic spices to create a colorful, flavorful masterpiece that can easily be cooked at home. Heat oil in a large pot to medium-low. Add fennel seeds and stir for 1 minute, until they turn golden brown. Add onion and cook for 10 minutes, stirring frequently until the onions have softened and browned. Add turmeric, chili powder, and cayenne to the pot and stir to combine. Then add the tomato paste and continue stirring. 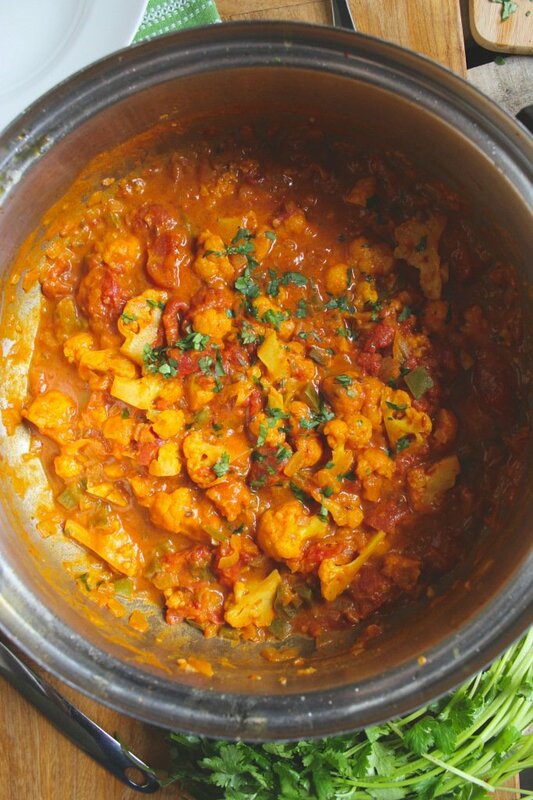 Add cauliflower florets, green pepper, tomatoes, coconut milk, water, and salt. Stir to combine. Cook over medium heat for 25-30 minutes, stirring occasionally. 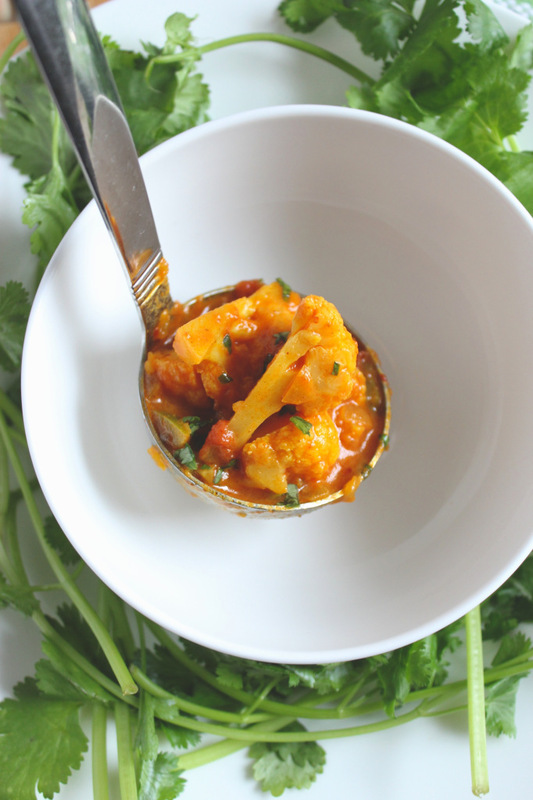 When vegetables are tender, remove from the heat and mix cilantro in. 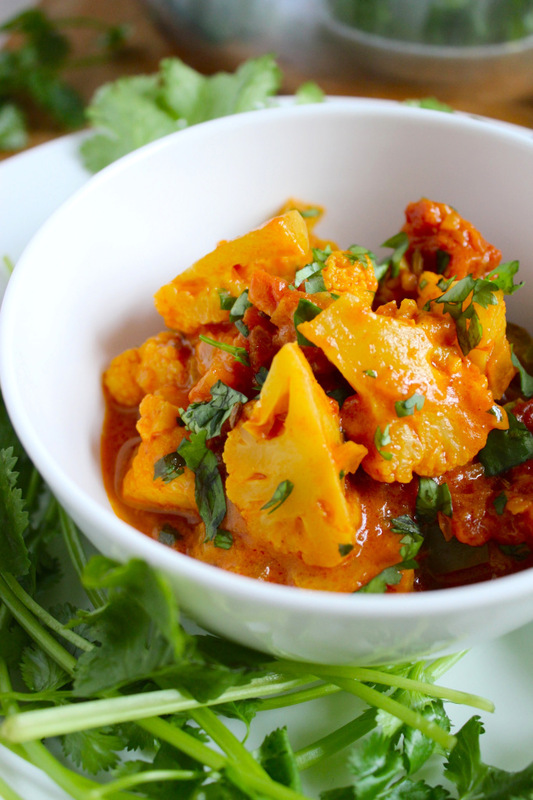 Serve with naan or over a bed of basmati rice. I made this recipe with a couple of modifications to fit my taste. I took out the fennel and cilantro (I am one of those people that think it tastes like soap!) and added minced garlic, one jalapeno (I like spice), and frozen green peas. I served it over brown basmati rice with garlic naan and it was amazing!